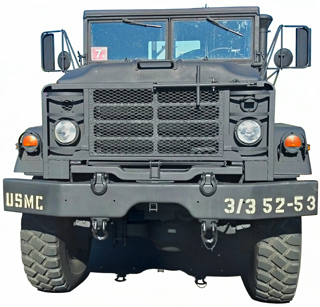 By Military Vehicles on this web page I mean vehicles designed for use in combat areas. 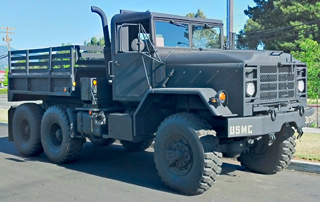 There are other military vehicles used for other purposes. 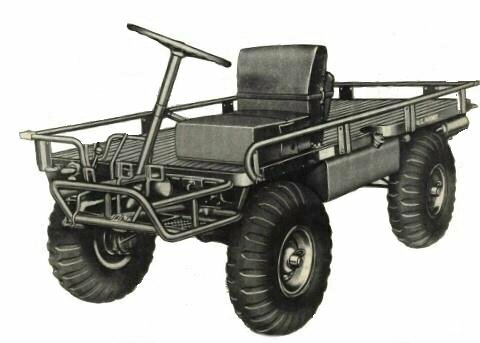 Mule - There was the M274 Vietnam era vehicle (Wiki) that you could ride or walk beside. 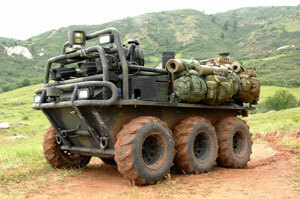 Now there's the Squad Mission Support System which is a robotic vehicle. Seen parked at the local Starbucks 10 May 2013 - the red "7" sticker in the window means it's not government owned. Although tracked vehicles are interesting, they can NOT be driven on the street. To get one somewhere you need a large 18 wheel truck trailer. Started about the close of W.W. II and was operational until about 1972. Single prop, triple 9 cylinder pancake radial engines ( 27 cylinders). Much larger in person that you would think from the photos. Also used for electronic warfare. Replaced the A-1 and not liked by most of the Air Force since it's not a fighter or bomber, but loved by pilots and ground forces. Based on a then controversial concept of using a 30 mm gatling gun to kill armored vehicles when tanks themselves used 100 to 150 mm guns to kill other tanks. But the rate of fire and multiple hits from overhead make the GAU-8 a tank buster. It's also designed to survive a lot of damage. This is a concept that was proposed during W.W. II to allow aircraft to attack a surfaced submarine. At the time, and even today, most aircraft have their guns facing forward. This is good for attacking other aircraft, but not so good for attacking ground targets. When attacking a surfaced sub the pilot had only one chance to cause damage, after circling around for a second pass the sub was submerged and out of harms way. By placing the guns in the left wing firing to the left the pilot can fly what's called a pylon turn where the wing points to a fixed point on the ground. This way fire can be maintained for as long as there's ammunition. 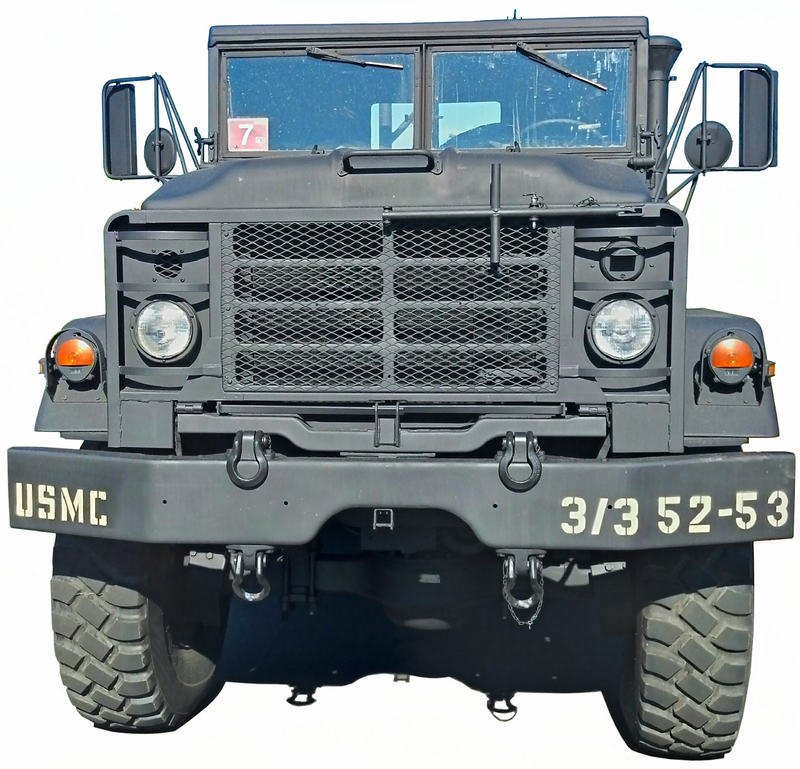 During the Vietnam conflict Gunships were brought into the inventory and were based at first on the C-47 cargo plane (needed to carry the large ammo load) and gatling guns pointing out the left side windows. The early Gunships used 7.62 mm gatling guns and were not designed for attacking armor, like the A-10. I'm not aware of a Gunship with a GAU-8, but it would be awesome. I'm not sure if this is a CAS mission, but the idea is to have a fighter equipped with a Radar Warning Receiver fly into an area where there are enemy Surface to Air Missiles (or guns) that are RADAR controlled. The Wild Weasel aircraft can then launch missiles to take out the enemy ground equipment ot cause it to be turned off, thus protecting other aircraft and providing air superiority. There's a movie called "First in, Last Out" that's a documentary about how the Radar Warning Receivers were developed at Applied Technology Inc (ATI) then on a hill behind Stanford. One day when visiting there I parked my red 427 Cobra in the president's parking spot, but they did not tow it away. In the movie Apocalypse Now the Patrol Boat Riverine (PBR) is featured throughout the film. 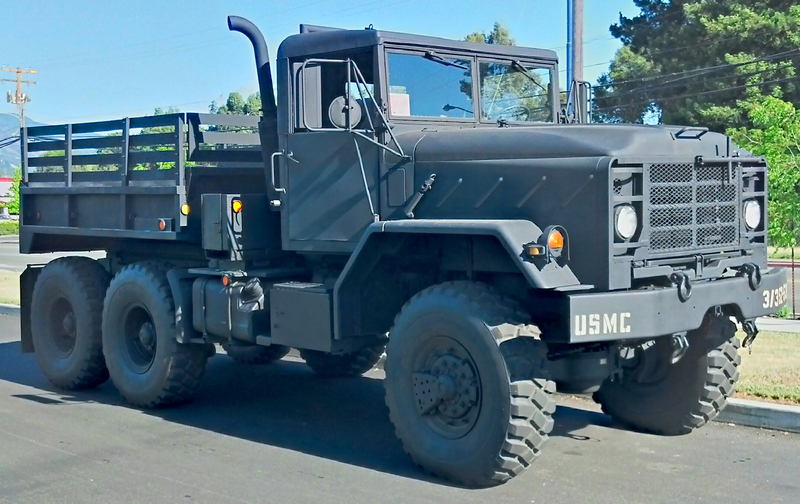 I got the opportunity to ride one during fleet week in San Francisco. Twin engines drive a water pump rather than use props that would foul in shallow water. The jet can be turned 360 degrees giving the boat incredible handling. On the short "excursion" in S.F. bay I must have hit some nerve of the boat captain and he started showing the limits of the boat's performance, causing the fire extinguisher to pull out of it's mounting, at which point he slowed down to a more normal pace. The acceleration can be described as "high". Subs are an interesting design problem. One way to design a sub is to make it close to neutral bouncy then use aircraft lift principles to "fly" it underwater. The W.W. II vintage subs were about 200 feet long, yet their hull crush depth was maybe 100 feet. So if an early sub got too nose or tail down it may sink. Later subs were made using stronger metals and have much deeper crush depths. But they have a problem because many were designed to have negative buoyancy (they sink if not going forward). So a propulsion failure can cause them to sink. A rouge russian sub tried to launch nuclear missiles against Hawaii and sank in the process. This was the start of the Glomar Explorer project built by Howard Hughes. The Hughes Mining Barge No. 1 (HMB-1) used to be in Pete's harbor, Redwood City, CA for many years. [an error occurred while processing this directive] page created 13 March 2004.